The collapse of Carillion raises many questions, including those surrounding the viability of public-private initiatives and the government’s apparent failure to practice effective due diligence before awarding contracts. Before it went into liquidation on January 15, 2018, Carillion was one of the government’s biggest private contractors. In the UK alone it could count 20,000 staff working on construction projects and delivering services to UK schools, prisons, hospitals and the MoD. In 2017 Carillion issued three profit warnings but was still awarded contracts worth £1.3bn to build key sections of the planned HS2 network. The subsequent collapse of the company now raises questions about the delivery of key construction projects and maintenance of critical infrastructure. In the near term, the company’s official receiver says employees, agents and subcontractors should continue to work on public services, offering reassurances that they will be paid. The situation isn’t as clear cut for those employees working on private contracts, although some suggest that work undertaken in consortium could see Carillion employees absorbed into partner companies. The current predicament is compounded further down the supply chain where around 30,000 individual firms are owed money by Carillion. 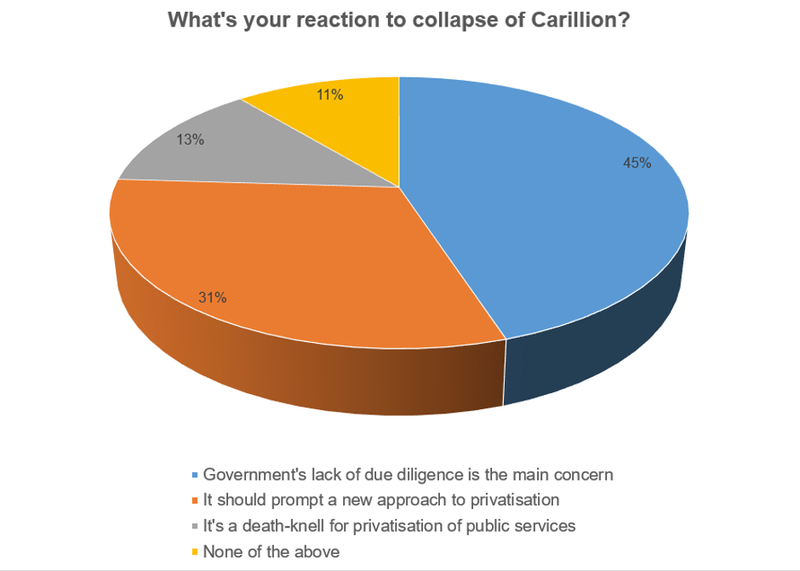 Of the 779 respondents to the poll, nearly half (45 per cent) agreed that the situation with Carillion arose because of the government’s lack of due diligence. Just under a third (31 per cent) thought the situation should prompt a new approach to privatisation, and 13 per cent agreed that the Carillion’s collapse marks a death-knell for the privatisation of public services. The remaining 11 per cent chose the ‘none of the above’ option. What do you think about the crisis at Carillion? Let us know via comments below. The question that should be asked is put simply “Are the civil servants who do the work on these big deals really up to it”. Question not needed. The answer “not up to it” is obvious. Too often the lowest bidder, not the best company wins contracts, this is true to some extent in all business, but, all to often after the contract has been signed the prices start to rise. Who pays for this? the tax payer. If more diligence is taken in the awarding of the contract then the current mess and price increases may become less common place. Utterly useless politicians in this country and civil servants should be very highly qualified and up to the job – they’re our last line of defence after all. Privatisation never really works for public services, you need to spend lots of money to get things right and shareholders would veto that, naturally. So we end up with cash starved rubbish!! Why does nobody ask questions of the people who authorize the payments to these executives? Why are the executive employment contracts allowed to be written in such a way that there is no penalty for gross incompetence. or failure to meet committed targets and obligations? This is due to poor management of the company by the controlling minds of management and lack of due diligence from the banks. There must be aggressive profits claw back from shareholders, banks, and directors remuneration that have been made in anticipation of profits covering the last ten years. The money is out there in the wrong hands and there must be aggressively recovered, to protect pension funds, small contractors, and the taxpayer from losses. The definition of the phrase ‘those in power’ has been demonstrated all too often to be synonymous with self-serving corruption. Unfortunately, there seems to be a climate of unbridled greed within our society, with little or no regard to the consequences. I firmly believe that Carillion’s problems are rooted in too many of those at the upper end of the food chain taking unjustified and unearned advantage of their position, to the detriment of anyone and anything in their way. Well put Ian. I could not agree more. Corruption and Greed by the Spivs running the Companies + corrupt and weak govenance is a recipe for disaster for the many. The answers to most of these questions posed is simple: do not let a grocer’s daughter and a bunch of spivs and barrow-boys (for younger readers, those who during war-time and times of austerity were ‘in’ when anything was going well but ‘out’ when the payments had to be made) and conn-artists loose anywhere where decency, honesty -what a carpenter once described as ‘good measure pressed down’- and integrity are the route to success. Chickens, home and roost would seem to be appropriate words. [Am I a left-ist pinko?] Evidence of a wider malaise? eating the seed-corn? I am just waiting to read or hear about the internal reports from staff with the interests of the Company at heart, advising the directors that what they are doing is wrong, dangerous, likely to cause it to fail: and who were dismissed for getting far too close to the truth and having the courage to say so. Unfortunately there are a lot of small sub-contracting companies now in the situation of not likely to get payment for goods or services ordered by Carillion and likely to also cease trading due to cash flow problems. 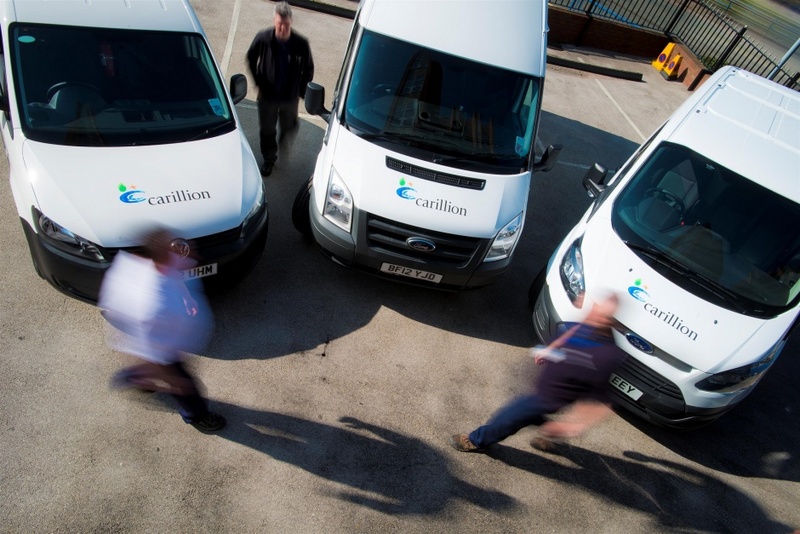 As a sub-contracting company we are very careful who gets credit and even more careful once with a credit account payment is received on our terms, just because Carillion are a big company does not necessarily mean they pay on time! There is a similar situation with dairy farmers and the big supermarkets, they take a long time to pay and they don’t pay to cover the costs of running a dairy herd. Never trust anyone with your money has always been my motto………. “Taxpayers to take the hit on Carillion collapse” is a newspaper headline today. Surely, if all the public sector contracts continue as before — particularly the facilities management projects — with government paying directly the ex-Carillion employees and subcontractors working at the sharp-end, then the cost to the public purses will be considerably less. This way we cut out fat-cat salaries and undeserved bonuses of the Carillion directors that could not control the company properly, and concentrate totally on the jobs in hand. . If you accept a contract with 120 day payment terms, more fool you. It is now quite clear you would be all the better for not having the job at all. Perhaps the Public Sector in placing the overall major with a “large” major contractor should insist that it be “open books” and that payments should flow to the sub-contractors first, with the balance to the major afterwards. ie Subbies get paid first. Looking the notes, we are all incredulous at how anyone can be paid an enormous bonus for such a calamity. I have always found myself sad at how nearly all African nations waste there natural resources and wealth though blatant corruption and disregard for anyone or anything else. Hard to believe the same has happened in the UK, who will pay any price for this? If the government has made a mess of handing out contracts, why would anyone then suggest they should do more and attempt to do the actual work? People look back on the old days with nostalgia, but the reality is that before privatization half the country was on strike. Now imagine that Carillion was run by the government and every week a different section of that organisation went on strike! Well if this is anything like the banking crisis no-one will be held to account and the inept management will go unpunished and no recovery of undeserved dividends and bonuses. How does something like this happen? Simple the White Hall pencil necks who dish out the contracts haven’t got a clue and they should shoulder some of the responsibility and should be sacked. And not get a thundering great handshake severance pay. What needs to be done to fix it? Alex Morris has already written it above. Will some-one in government just do it without all the lawyers jumping on the band wagon and costing more tax payers money. Whichever way you cut it yet again it appears the higher up the food chain you are the more likely it is you will get your bacon. The FAT cats get fatter and the lesser mortals can scrap for whatever is left, if anything! The pity is the smaller sub contractors will, in some cases, go out of business. The Government must shoulder the lions share of the blame, due diligence???? And as for awarding more contracts to keep the sinking ship afloat, beggars belief. When all is said and done it will be the poor old tax payer paying the bill yet again. Ministers and civil servants alike you should be ashamed. Will we ever get a real picture of what has gone here? I would be dismayed but not surprised to learn that the suits running the place and the financials and legals that came up with the 120day terms (no doubt feeling very pleased with themselves) have been an elite milking the system – it’s not as if they haven’t been getting paid by government is it? Where has all that money gone? 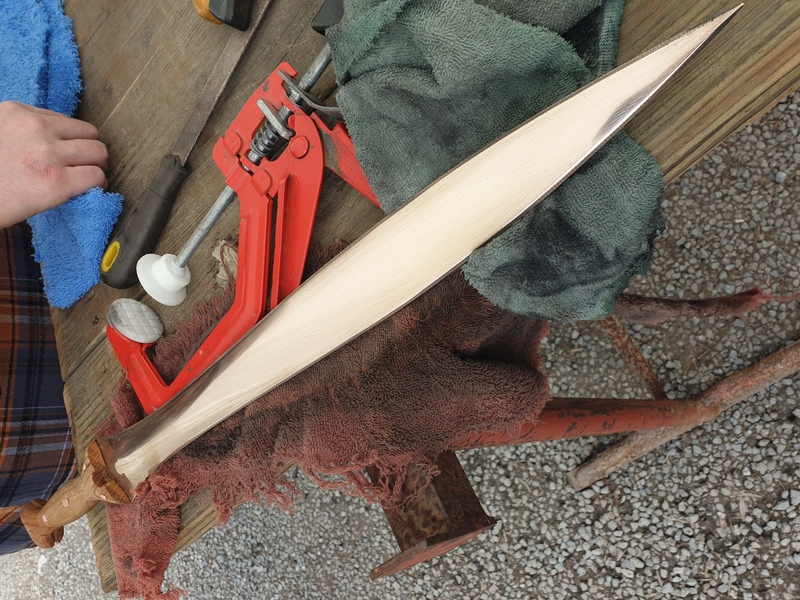 At the end of the day those doing the REAL value adding hard graft – probably on lower wages and the SME’s doing real work get completely done over and carry the cost – including all the extra stress and strain this will cause – detracting from getting anything useful and satisfying done with their time. Would I be surprised if the suits with no mortgages are on a yacht somewhere exotic saying it’s a shame it’s all over??? Where were the internal and external auditors in this shambles? I suspect there must be some panicking going on within the financial part of the business as to why signals were not picked up and acted on. The troubles had been noted but contracts were still awarded (why? by whom and on what basis? Obviously not value for money). This is another example of the monumental incompetence and ineptitude that permeates all levels of government and associated agencies. It is rampant, endemic and at industrial/weapons grade strength. The expectation that directors and related mandarins will fall on their swords is probably ill founded. Something needs to be done to reform the whole rotten system. who will pay any price for this? You, your children and grandchildren! The interest? 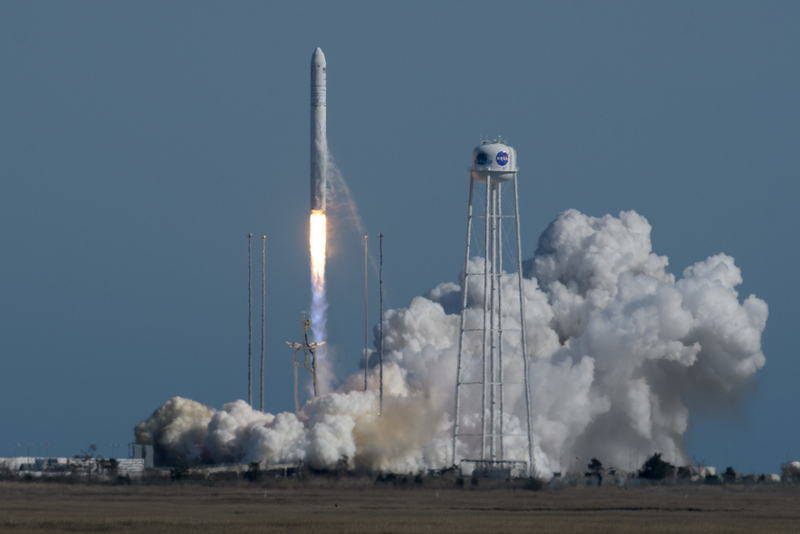 payable per annum on public debt is already a number so large that to use the term astronomic (if any non-technologist who uses it, and many do, has any idea what it means?!) would be mild. All the sham-groups (I cannot bring myself to call them professionals because the implication of that noble estate is that they are self-policing) have insulated themselves from the results of their actions (often in-actions) and have no check or balance from the market-place, capitalism and democracy. 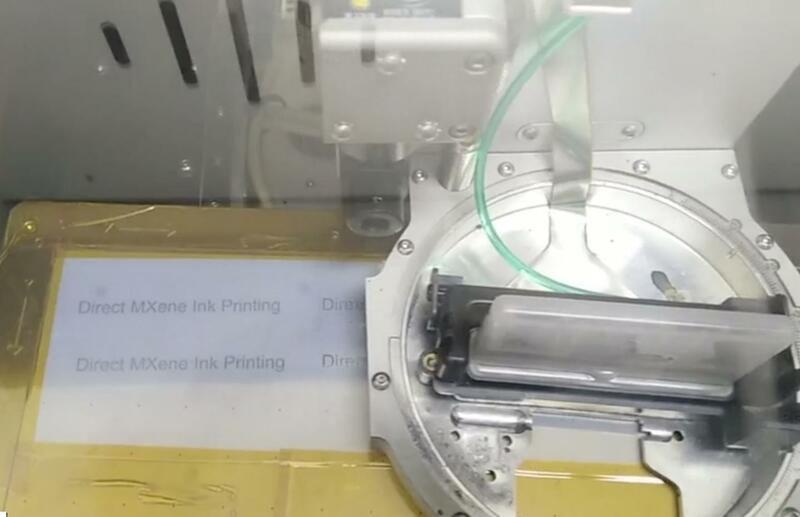 Nice work, if you can get it! How much more will it cost the Government in benefit payments to those who lose their jobs, and the subsequent loss of income tax, than to have paid to keep the company going until a better solution could be found? We all have views on civil servants being tasked with the role of senior buyers (which includes Due Diligence checks). If they could do the job they wouldn’t have become pen-pushing civil servants in the first place. As for the political aspect, we all know that this was partly driven by those in power and the mantra ‘competition always makes everything good’. Well, it doesn’t. But the alternative is leaving everything to civil servants. One thing nobody seems to have mentioned is the bonuses paid to executives within Carillion. Bonuses for what – profit warnings and losses? I am old enough to remember 1971 and the demise of a well known aero-engine Co based in the North Midlands (in a city named after a horse-race -or is it the other way round) which had very challenging ‘terms’ applied to its sale of engines to an equally well-known US aircraft manufacturer located not a million miles from Georgia. The collapse of the one precipitated the end of the other. I do recall the CEO of my then employer (perhaps the only intelligent remark he ever made) circulating a management guru’s comment of the time “placing impossible terms on a supplier is inviting him to let you down! and he will, probably taking you down with him!” He did. My brother-in-law was a very senior Engineer (Director thereof) with a large UK firm: indeed so large and diversified that the grocer’s daughter’s task-force would not have left port without ‘his’ engines and other bits of military kit made by his associates. The conglomerate was run by a former accountant: who we often opined would have been happiest if they made nothing (having sold it all off) and the CEO simply sat at a screen stuffed with electronic paper which he would trade to make money! This fellow also demanded 6 months ‘credit’ from suppliers. My brother-in-law (lets call him Tony) told all suppliers to ‘enhance’ the amounts they would invoice by their calculation of the interest payable on the original (and proper) amount for the six months before they were paid. The clerks at the top never realised. So everyone was happy. Were they? Philip Green : appointed as number 10 advisor on “corporate responsibility” by David Cameron. Keith Cochrane : bonus grabbing expert. And so the sorry list goes on, a list of snout filling cronies. Government due diligence? Commercial confidentiality used to facilitate incompetent management – the hit taken by the suppliers (their employees now at risk) and the public purse – directors contracts honoured?? Nauseating! How many lessons need to be learned? Trust and integrity are scarce resources. This government seems to be so naive as to believe that all companies & services will self regulate themselves. This should be done by government to control how much is done by these companies. This gives smaller companies some protection from bad paying practices. This would also protect the general public from a number of badly run processes such as the railways, public transport, shops & warranty issues etc. This is but the highest profile example of personal greed which has been revealed at a number of organisations from the obscene salaries paid to a lot of people in both Public and Private sectors. Perhaps thay have taken the lead from footballers who get hugh amounts of money for little contribution to the ecomony. Don’t suggest that these industies should be nationalised if you know anything of the cavalier attitude of the Civil Service and Local Governments to tqaxpayer money not to mention the built in inertia in those organisations. What needs to be done is that those responsible for this mismanagement should be immediately barred from holding any similar rolls until they have cleared their names. The problem with this approach is that the fall guys have to be identified from those who are really responsible. The whole country from top to bottom needs to look at their individual responsiilities and morals. There are a large number on the make and an even larger number who expect ‘them’ to do everything. When you look in terms of things like ticket and merchandise sales, and particularly the huge sums that change hands for TV rights, those footballers might make a bigger contribution to the economy than you’d think (although the contribution of individual players would be difficult to quantify). Let’s guess the outcome from this ! A lot of noise, calls of “how could this ever happen”, then after a short period, silence and a return to the old ways. No-one (responsible) will lose their job or suffer financial penalties. The guilty parties will take up new, similar, roles on the next gravy train. Do we ever learn, do things change ? NO ! Our society is truly sick and it will take a war or a revolution to fix it – maybe Trump is the answer !! Radical! But, maybe, just maybe you’re onto something. However, we would have the same politicians and bad directors of the Mr Green style running the war effort heaven help us all! The malaise lies at the heart of Government. We have a whole generation of toddler-minded and power hungry polititians with absolutely no experience of, or interest in anything except climbing the political greasy pole. Minimum age to stand for parliament should be 40yo, and with demonstrable industrial and commercial, ie real life, experiences to prove before adoption as a Parlimentary candidate . Government contracts should only be awarded to those businesses which pay their sub-contractors within 30 days. If private contractors cannot pass this simple basic test of solvency and business ethics then they should not be engaged by the tax payer. The governance of these contracts must be reviewed urgently and some decent standards applied to safeguard the supply chain to businesses such as these. Got it in one! Then having been elected under the “new” rules, they should be required to stand in a different constituency each time they seek re-election, gets them away from their local cronies as well. Just a comment from the past; The North East Development and T Dan Smith seemed to be doing much cross-party corruption in the 60s; it does seem to be a construction oriented thing – in which people get things that are not wanted at high prices (eg HS2 and all the support for “new builds” – with dubious claims of boosting the economy and “helping” affordable housing ). Perhaps there is a need for a an agencies that could overseas finance and construction projects and funding – could even work for the banks! !